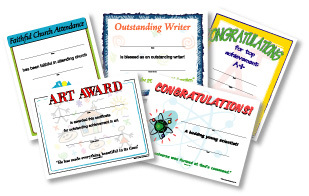 These Christian certificates are excellent for Learning Centers, Kindergartens, Preschools, music events, sporting events, and much, much more. The CD-ROM includes 50 colorful, reproducible, Christian school certificates with Scripture verses. The 50 full color backgrounds allow teachers to create hundreds of possibilities. The Christian school certificates are “typeable” to be personalized right on your computer. Every certificate also comes with just the background so that you can insert your own text. Every certificate includes an appropriate Bible Scripture passage.